The future global business environment is complex, volatile, extremely competitive and continually changing. Senior top executives need to ensure that their organizations have and will continue to have senior leaders to successfully navigate through ever increasingly challenging times. Leaders must be proactive to foresee potential problems and opportunities and to solve problems and take advantage of opportunities before their competitors. The major reason potential top talent leaves an organization, as reported by Forbes magazine is that the companies “failed to develop their skills: leadership isn’t a destination – it’s a continuum. No matter how smart or talented a person is, there’s always room for growth, development, and continued maturation. If you place restrictions on a person’s ability to grow, they’ll leave you for someone who won’t.” In other words the problem is a lack of qualified internal talent for senior executive positions. The Reboot Executive Institute (REI) develops future leaders through our commitment to delivering outstanding senior executive programs. These sessions provide the knowledge and skills required to enhance both corporate and personal performance, resulting in increased value creation to the organization and its senior management. “Leading and Executing Change in the Digital Economy”is a 3-day program on how digital technologies have triggered profound change in social and economic interaction, behavior and how all aspects of public and private organizations function. This executive program exemplifies that change is not something needed once in a while but constantly. This necessitates a change skill set that is constantly in use, just as are other managerial and leadership skill sets are required. The program is critical for current and future leaders. Senior, mid-level executives and managers requiring comprehensive training for performance enhancement and value creation are prime attendees. 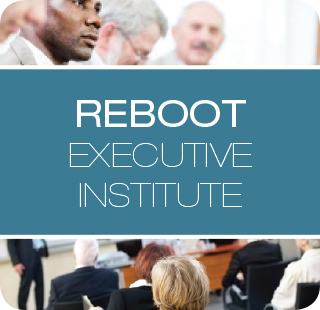 The cost to attend Reboot Executive Institute in February of 2014 is $4,000.00 CAD. If you are a sponsor at the 15th Annual Privacy and Security Conference in Victoria, please contact us regarding discounted tuition fees for the Reboot Executive Institute. Please enter your email address and press the submit button to select the industries you would like to receive updates for.